- black retriever puppy on 3rd no. But Thank God what I already bought for her is on 1st no. on her list. As for little one Ms. S, I have to say she has good observation. Couple of days back I asked her "What do U want for Christmas dear" and she answered "I want my Birdays" means birthday cake. Today I asked her "What do U want for Christmas dear" & answer was "I need presents, like yellow & red, and U can have candy in there, I'm gonna open it & we gonna eat it we can share it with all friends" and when I said why U want presents answer was "I NEED Presents". And she added Santa is like my "Grandpa Santa", he gonna come & eat one cookie. Thanks to Clifford & Calliou. 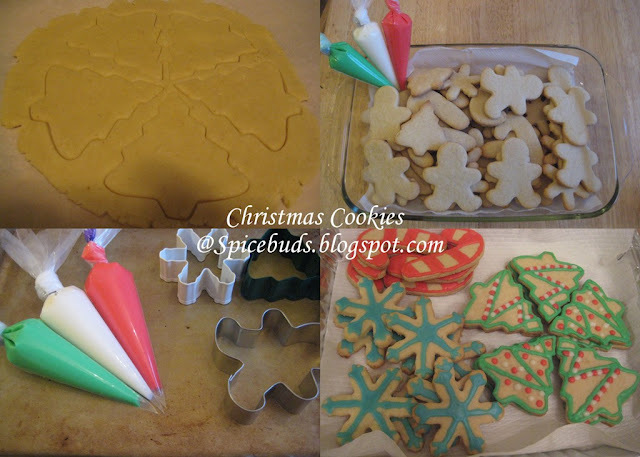 As for me I baked 6 batches of Eggless Sugar Cookies Couple of days back for R's school party. I've already posted these Eggless Sugar cookies back in January but this time I decorated them with eggless Royal Icing. Recipe for the icing is again from Aparna's blog who has further adapted it from veglicious. Mix together sugar & cornstarch. Add lemon juice & milk(one spoon at a time) & mix it until the mixture become smooth but thick paste. 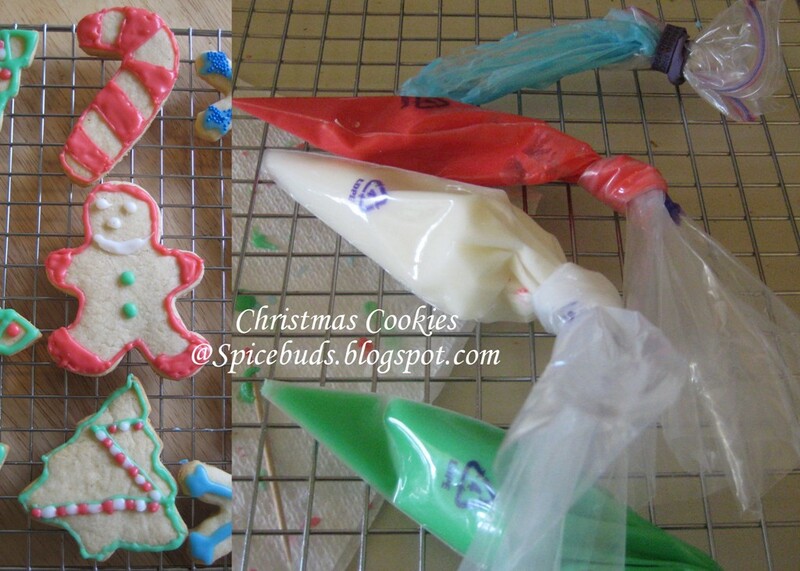 Divide the icing into different bowls & add few color drops in each as per your requirement, Mix. Keep it for about 5-7 minutes, so that if any air bubbles are there will come to top. Adjust the consistency of icing by using few extra drops of liquid(water/milk) for thin version or little extra icing sugar for thick version. Transfer the icing to piping bags as otherwise it will harden. (I got the icing ready in piping bags a night before). 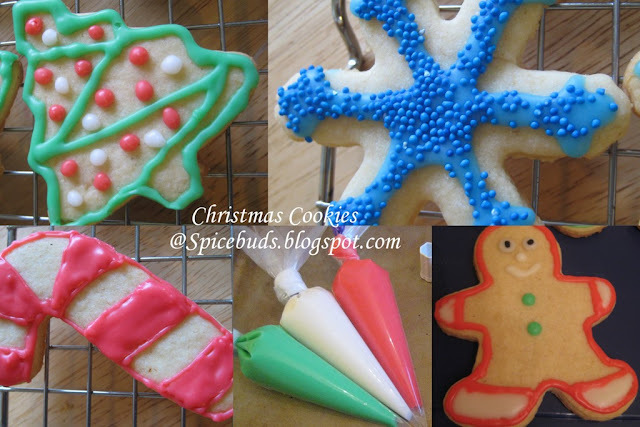 Note : If U need some tips for icing cookies please visit this post on Aparna's blog or for detailed version check this one out. R also tried her hands on cookie decoration, I would say really good for her age. 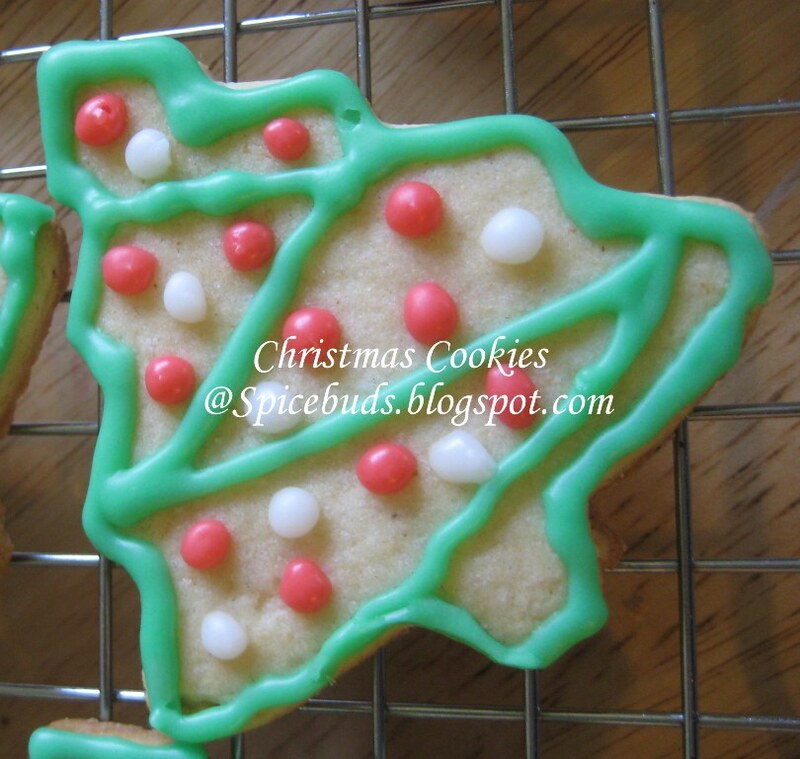 Note : Cookies without any decorations can be kept in an airtight container for few weeks. Other day I read it on some website that they can be freezed also for almost a year. But when it comes to decorated cookies, keep them in the airtight container once they have dried completely.Will stay fresh for around 3-4 weeks on the shelf. Any Royal Icing decorations are not suggested to refrigerate.